Enforcing speed limits is an integral part of policing your roads. Over 10,000 deaths are caused each year by speeding (NHTSA). No police force can catch every speeder, every time. But our enforcement speed cameras can. Speed camera enforcement prevents drivers from speeding. Police departments across the country use them to dissuade dangerous driving. Enforcement Logix speed cameras capture speed violator data and help to better enforce speed limits on city roads. 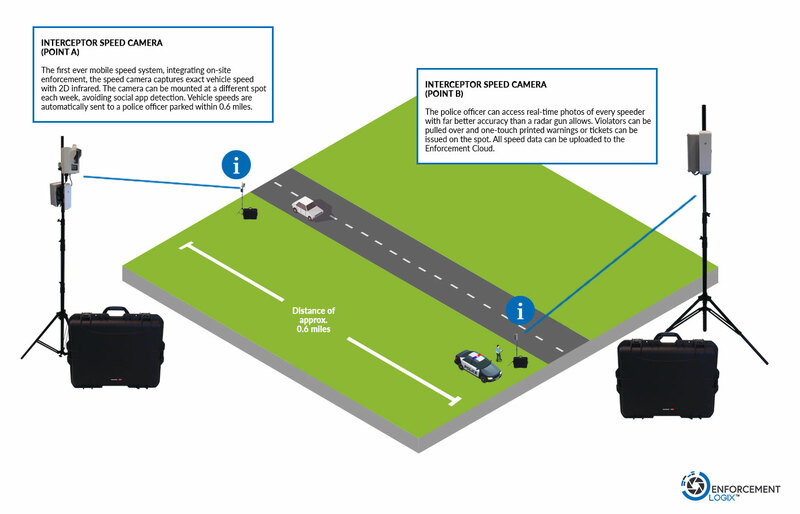 Enforcement Logix camera systems provide the security you need for safer roads. They offer advanced features such as the ability to capture multiple vehicles in two lanes simultaneously and to avoid detection by radar. They can be mounted as mobile or fixed units. On-site enforcement is also an option with our systems. This allows you to ticket drivers instantly from a vehicle parked in close proximity to where your speed camera is mounted. Vehicle images capture license plates along with a time-stamp of when speeding took place. Precise OCR (optical character recognition) ensures that no speeder goes by undetected. Automated warnings or tickets are then sent out to speed violators. At Enforcement Logix, we provide complete solutions for streamlined, ongoing enforcement. We help you conduct traffic studies and analyze which roads need better enforcement. Our support team can help as you install your speed cameras and later support your staff as they use them.